Military Army MOLLE Utility Medical First Aid EMT Pouch. A great all around utility pouch for everyday carry. 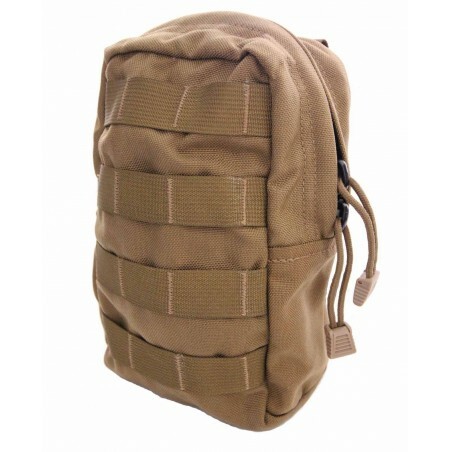 Label on manufacturer's packaging reads: #280 COY, Modular GP Utility Pouch, Medium - Vertical, MOLLE Compatible - Coyote. This heavy duty nylon pouch is a must have for the active outdoorsman. Great for EMT Pouch, First Aid Items, Medical Bag or Utility Pouch. MOLLE webbing compatible. Double zipper closure with large paracord pulls. Zipper color is black. Made by Specter. Does not include any first aid items, this is the pouch only. Approximate size: 9" Length x 6" Wide" x 4" Deep. Weight 7.2 oz.